The Monkey's Fist was created so that a line could be thrown from ship to ship or ship to dock. 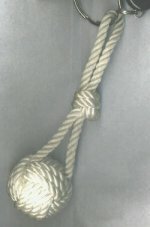 Inside the knot is a weighted ball. You could use a small round pebble, marble, wooden ball or tightly wadded paper. 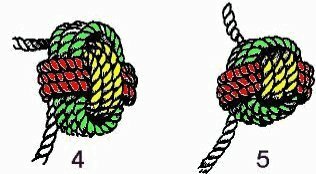 The Monkey's Fist knot is easy if you follow these simple instructions. Take your time and don't be afraid to start over again. 1.Begin by wrapping the cord around four fingers. Make 3 revolutions. 2. Go between your middle and ring ringer and wrap the cord three times around the center of the first loops. 3. It might be easier to remove your middle and ring fingers while doing this. 4. Insert the marble and make the final three wraps. 5. Once all of the wraps are complete, carefully tighten the loops. I like to use a small screw driver to help pull the ropes. If you would like, you can leave a long loop in the middle wraps. Tie an overhand knot and use it as a key ring or loop it on your backpack. I clip off the free ends very close to the ball and tuck them in so that they are invisible. Good Luck.... and don't give up!